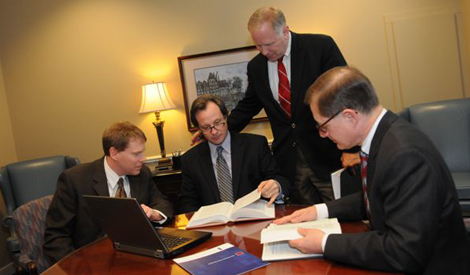 Onda, LaBuhn, Rankin & Boggs Co., LPA is a full service law firm offering expertise in several diverse practice areas. Since 1991, we have committed ourselves to serving the needs of our clients with a value-driven approach. In accomplishing this goal, we utilize the vast experience of our attorneys, paralegals, law clerks, and support staff. While each client can expect the dedicated attention of an attorney specializing in the practice area most closely associated with their needs and objectives, our team approach is often used to achieve optimum results for a client. Every case, every client, every solution is a priority as we help our clients achieve positive results. We are proud of our reputation as a law firm with a sophisticated practice that provides the personal service our clients expect. Our clients range from sole proprietorships to government entities and family businesses to major multinational corporations. The firm’s attorneys have a wealth of experience to resolve disputes, proactively avoid conflicts, and structure your business transactions in a skillful, efficient way. We bring real-world business and government experience to solve your business matters. Our clients have benefitted from our expertise for decades. 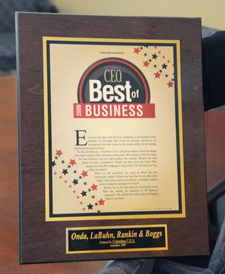 Onda, LaBuhn, Rankin & Boggs Co., LPA was voted the Best Law Firm (less than 50 attorneys) by the readers of Columbus C.E.O. magazine and our partners have received the Ohio Super Lawyers award. The referrals from clients and other attorneys prove we are a trusted business law firm dedicated to our clients’ needs. Onda, LaBuhn, Rankin & Boggs Co., LPA is committed to effectively representing its clients and enjoys developing on-going relationships that allow for our client’s future growth and prosperity. Through our commitment to excellence, we have gained respect from the judiciary, the legal community and, most importantly, our clients. At Onda, LaBuhn, Rankin & Boggs, Co., LPA, your success is our standard.